When I heard about this problem it really irked me. 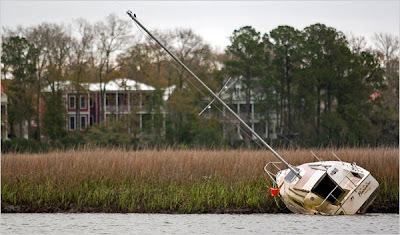 People who bought boats in boom time and can no longer afford them are abandoning them. They remove all identification, sand off their cutesy vanity names (like Pier Pressure or Sea-N-Red, a little too appropriate now), and run the boat aground or just push it out to sea. Of course it bothers me that these people are treating the ocean like a dump. Boats are full of (and covered with) toxic chemicals and made of ingredients that are not always so biodegradable. But there's something deeper than the disregard for the environment here. There's an opportunity going unnoticed. It's true that the boats have become a financial burden, they can't be sold because the market is flooded, and proper disposal is costly. But couldn't the materials used in these unwanted boats be reutilized elsewhere? We've all seen those tote bags made from repurposed sail cloth. Why can't the same idea be applied to the whole boat? We live on a planet of finite resources. We take from the earth and repay it with trash. Why can't we give old goods a new life so that we don't end up living on a giant garbage dump? Have any ideas for how old abandoned boats can be reclaimed and reused? Drop a line in the comments section.